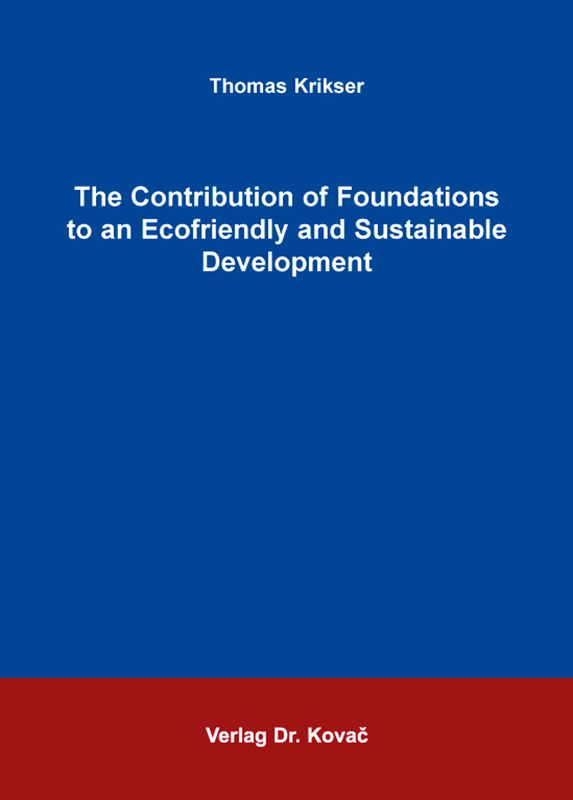 The Contribution of Foundations to an Ecofriendly and Sustainable Development. Dissertation von Thomas Krikser, Verlag Dr. Kovač 2016, 160 S.
Foundations have become an important player for finding solutions for societal challenges. Besides other issues, environmental activities belong to the main topics of foundations. However, there is a lack of research on the contribution of environmental foundation for an ecofriendly and sustainable development. This scientific desideratum occurs especially in Germany where no comprehensive database on foundations exists, and only estimations about their environmental impact are available. Therefore, the present research explores financial power, scope of activities, and other basic conditions of foundations in a comparative perspective. Using multivariate statistics and qualitative content analysis, the articles of this cumulative dissertation investigate differences and similarities of environmental foundations in a sample of 201 foundations in Germany and 79 in the United States. Additionally, qualitative expert interviews with board members of community foundations in Germany help to generate a broader picture of drawbacks and opportunities community foundations are faced with. In different studies the author demonstrates the limitations especially for German foundations concerning financial power and professionalization based on multivariate data analysis. However, the studies show that environmental foundations can contribute to ecofriendly and sustainable development - especially on the local level. Furthermore, types of action that are performed by environmental foundations as well as the role of society and culture in shaping these activities are discussed. Furthermore the challenges newly established foundations have to deal with will be demonstrated. Among these challenges, the study shows that gaining social trust and operating catchy projects is strongly connected with fundraising and campaigning for donations.